In a 12 to 1 vote this morning, City Planning approved NYU’s Core expansion plans for two superblocks in Greenwich Village designed by Grimshaw with Toshiko Mori and Michael Van Valkenburg. In slow and deliberative pace, City Planning Commissioner Amanda Burden read from a prepared text that included several aesthetic and few programmatic changes to the proposed plan. 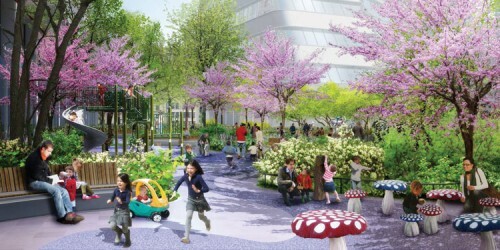 The new plan will reduced the size of the overall project from 2.47 million square feet to 2.1 million. Most of the below grade space will be retained. All four proposed buildings were approved with tweaks here and there. Both of the so-called “Boomerang Buildings” will be reduced in height that will not exceed the slabs of the Washington Square Village buildings that frame them. 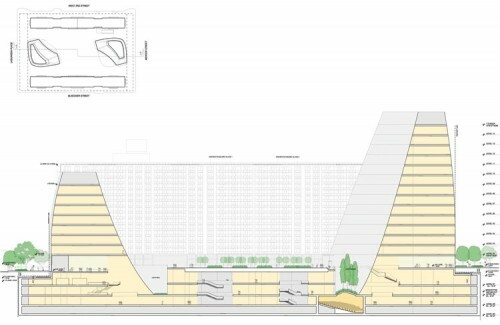 The “Zipper Building” will not be allowed to include a hotel component as part of its programming. The proposal for a temporary gym was also nixed. 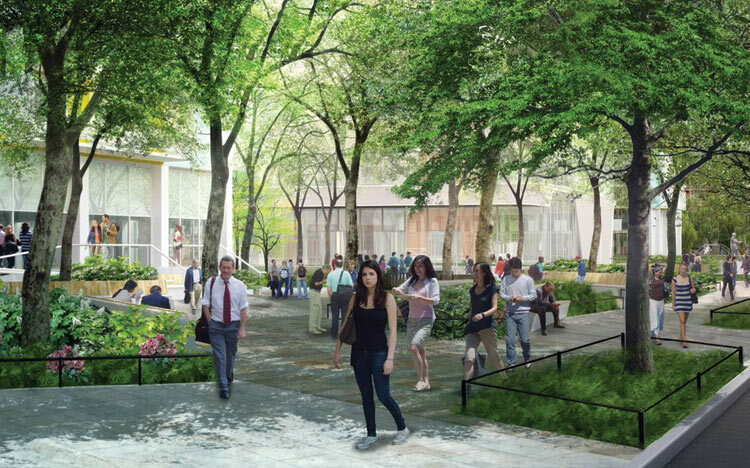 Of the changes to the nearly four acres of public space the most significant is that the university will not be permitted to build beneath the green strips on the northern superblock, thus saving the mature trees that are on the site. 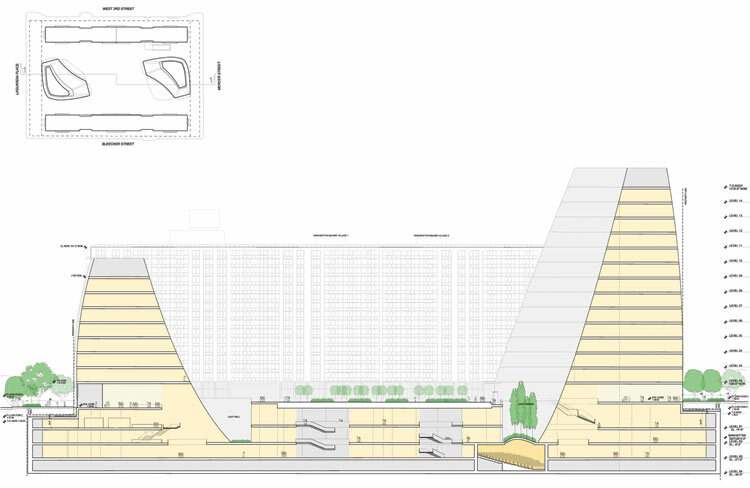 The proposed light wells that allow natural light to flow to the massive subterranean structure will be reduced on the Mercer Street Boomerang Building so as to create more open space at grade. The creation of the an Open Space Oversight Organization will be set up to insure public oversight, and allow for future modifications, “especially as the space is not to be built until 15 years from now,” said the Commissioner. As the lone commissioner to vote against the proposal Michelle de la Uz praised the university’s “laudable efforts,” but noted that it was done to address the impression that “their growth thus far has been haphazard and insensitive.” She also voiced concern, shared by many in the community, that the programming for the northern superblock is still too vague. She added that a lack of affordable housing and a public school were also troubling. In the end Uz concluded the project’s size has not dramatically changed, as indeed it hasn’t. For their part NYU seemed pleased with the outcome, with NYU’s vice president of government affairs Alicia Hurley finding most of the changes as “not an impediment” to the university’s overall goals. The one building that seemed to get lost in the shuffle was the building replacing the Morton Williams super market on the southern superblock. That building is supposed to house the public school which sparked Commissioner Uz’s concern. Hurley said that ongoing talks with the Department of Ed are going well. “They are interested,” she said. After the hearing, Andrew Berman, executive director of the Greenwich Village Society for Historic Preservation, employed the shoehorning-the-Empire-State-Building-into-the-Village phrase he’s used throughout the process to describe the plan. He did not seem particularly surprised by the outcome, saying that every major development application that went before this commission was approved. Still, he held out hope that the next stop for the application at City Council will put a halt to the project. “Hopefully City Council will show some independence from the mayor,” he said. Open space above the underground building will be slightly expanded.